Fr Andrew Downie moves in to St Cuthbert’s on 5 September 2016 to take up his roles as Catholic Chaplain to Durham University and Parish Priest of St Cuthbert’s. 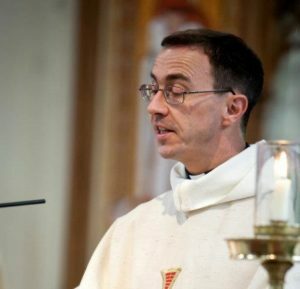 Fr Andrew is a native of Sunderland; he studied Natural Sciences at Cambridge and later qualified as a solicitor. He trained for the priesthood at the Venerable English College, Rome, where he gained a Licence in Fundamental Theology from the Pontifical Gregorian University. Ordained priest in 2002, Fr Andrew came to St Cuthbert’s in September 2016 from being parish priest of St Patrick’s and St Pius X, Consett. In the past he has served as Vocations Director for the diocese and Chaplain at the Universities of Newcastle and Northumberland. Fr Andrew has a special interest in the teaching of Vatican II, and in the encounter of faith with contemporary culture, and is studying for a PhD part-time in the University’s Department of Theology and Religion.